A graphic representation of the official South African Tidal Data. 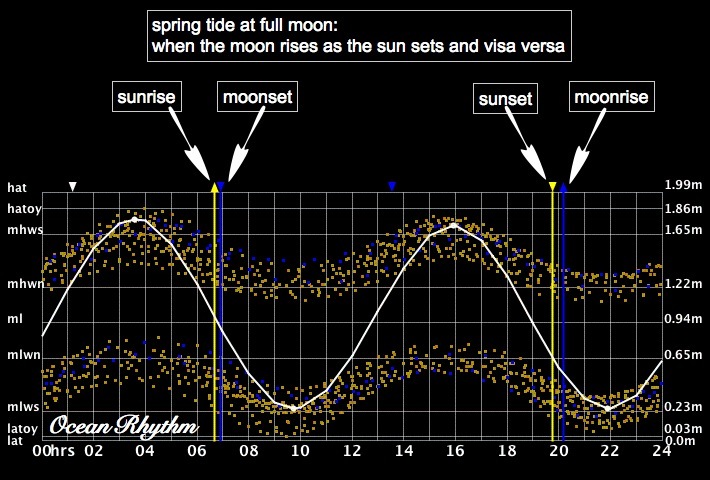 The images present - at a glance - specific and relative information about the predicted tidal, solar and lunar variation at a given location for a 24 hour day. The "wavelike" white line shows the tidal variation for the given day. A white dot on the white line indicates the high or low tide respectively for the day in question. 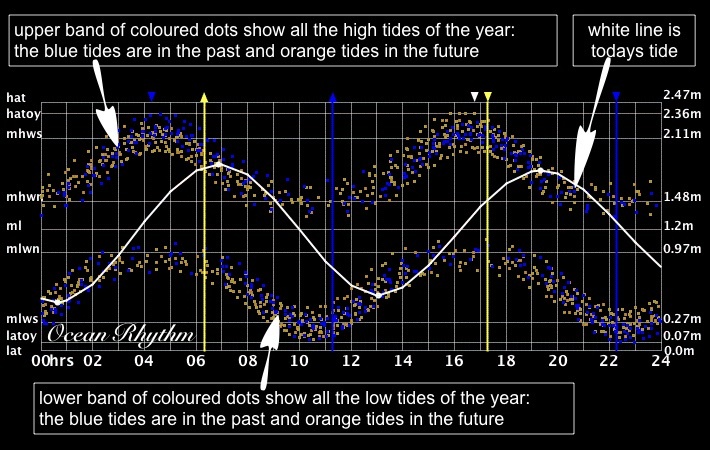 The two bands of orange and blue coloured square marks indicate all the predicted high and low tides for the specific year at that location. The upper band of coloured marks are all the predicted high tides, whilst the predicted low tides are presented by the lower band of coloured square marks. When the tide marker is orange, then that specific tide is still to come later in the year. When the marker is blue, then that tide has already passed. It follows that towards the end of the year there will be many blue marks, whilst at the beginning of the year the marks will be predominantly orange. These two bands of predicted high and low tide values establish a footprint or tidal range for a given year. Predicted tides will always lie within this range. Note that such a footprint shows during which times of the day predominantly high-water or low-water will occur. For instance, "high water" is oriented around the 1st and 3rd quarter of the day, whilst low water is oriented around the 2nd and 4th quarter of the day. Primary tidal ports are: Walvis Bay, Luderitz, Port Nolloth, Saldanha, Granger Bay, Simon's Town, Hermanus, Mossel Bay, Knysna (lagoon), Port Elizabeth, East London, Durban and Richard's Bay. These ports are high-lighted on the selection page in blue and reflect tide data provided by the Hydrographic Office of the South African Navy. Primary ports have an official Chart Datum or reference altitude. All other (secondary) ports reflect tidal data which was synthesized by Ocean Rhythm. These ports do not have a chart datum (or reference) and the tide height shown is a range value between the highest and lowest tide values for the year and is not relative to a reference. The sunrise and sunset are indicated with yellow lines and arrows, whilst the moonrise and set are indicated with blue lines and arrows. A downwards pointing arrow indicates a setting action whilst an upwards pointing arrow will indicate a rising sun or moon. The times provided are those for when the upper portion of the sun or moon coincide with the horizon of the earth - ie at the start of the sun or moonrise and at the end of a sun or moonset. 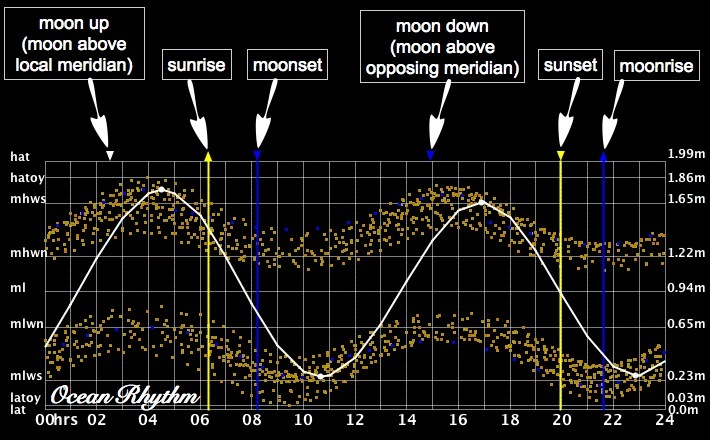 The sunrise, sunset, moonrise and moonset times have been calculated for a flat earth. This implies that if your location is flanked east or west (or both sides like parts of Hout Bay) by a mountain, the rise and set times will not reflect this feature. The moon requires sunlight to shine upon it for it to be visible. As such, the moon will be full when the moonrise is approximately at the same time as the sunset. A new moon occurs when the moonrise is approximately at the same time as the sunrise. This can be clearly read from the images. After new moon follows a waxing (growing) moon. Likewise, after fullmoon follows a waning moon. The free floating white and blue arrows on the upper bar indicates the time when the moon will be above the local and opposing meridian. The local meridian is the longitude of the specific location in question. 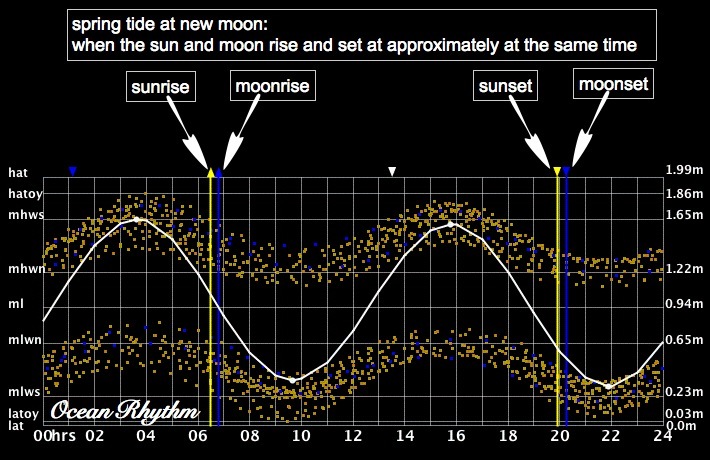 These times are also referred to as "moon up" and "moon down" by rock and surf fishing people. The white arrow shows the time of moon up. Please read the article on "Best Fishing Times" in the article section which you can reach from the home page. HAT and LAT - highest and lowest tidal values predictable over an 19 year cycle. MHWS and MLWS - mean (or average) high and low values predicted for spring tides over an 19 year period. MHWN and MLWN - mean (or average) high and low values predicted for neap tides over an 19 year period. HATOY, MLOY and LATOY - highest, mean and lowest tide values predicted for one specific year. (not over the 19 period). Socondary ports only reflect HATOY, MLOY and LATOY data and have no reference altitude. All supplied data is relative to South African Standard Time. That is Bravo time or UTC plus two hours or Time Zone 2. This situation has the following implications for Namibia. During April to September (inclusive), Namibia switches from Time Zone 2 to Time Zone 1 (or Alfa time or UTC plus 1 hour). That makes South Africa one hour later than Namibia for that period. The user has to make these adjustments themselves please.